Left to Right: (front row): Strength & Conditioning Consultant Al Vermeil, B.J. Armstrong, Michael Jordan, Horace Grant, Bill Cartwright, Scottie Pippen, John Paxson, Strength & Conditioning Assistant Erik Helland. 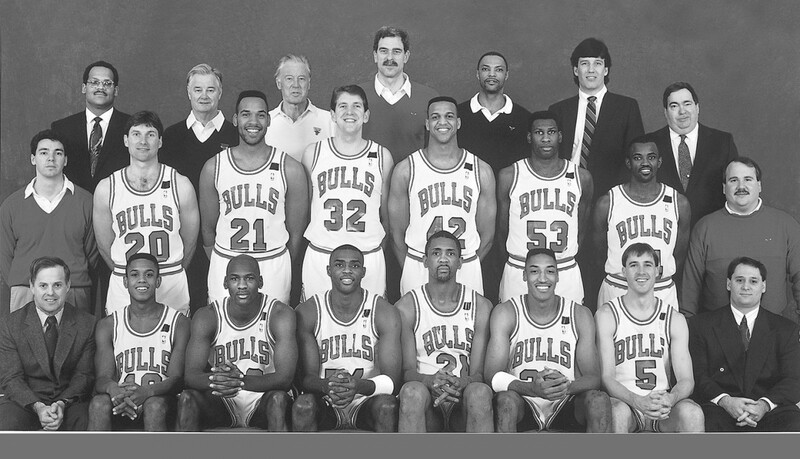 (middle row): Trainer Chip Schaefer, Bobby Hansen, Stacey King, Will Perdue, Scott Williams, Cliff Levingston, Craig Hodges, Equipment Manager John Ligmanowski. (back row): Scout Clarence Gaines, Jr., Assistant Coach Tex Winter, Assistant Coach Johnny Bach, Head Coach Phil Jackson, Assistant Coach Jim Cleamons, Scout Jim Stack, Vice President–Basketball Operations Jerry Krause. Won a then-team-record 67 games overall ... won a then-team-record 31 road games ... tied franchise-best home record with 36-5 ... won a then-team-record 14 straight games from 11/06/91 to 12/06/91 ... tied eight-game road win streak team record originally set in 1989-90 (11/06 to 11/30) ... fin- ished with the league’s best field goal percentage (.508). First round, Mark Randall (Kansas). Won franchise’s second straight NBA title defeating Portland 4-2 in the Finals ... swept Miami 3-0 in the first round ... defeated New York 4-3 in Eastern Conference Semifinals ... beat Cleveland 4-2 in Eastern Conference Finals. Michael Jordan was named the NBA Most Valuable Player, NBA Finals Most Valuable Player, All-NBA First Team, All-Defensive First Team, captured his sixth straight scoring title and started for the 1992 East All-Stars ... Scottie Pippen started for the 1992 NBA East All-Stars ... Pippen was also named to All-Defensive First Team and All-NBA Second Team ... Jordan and Pippen named to 1992 Olympic basketball team ... Craig Hodges won his third straight Three-Point Shootout contest at All-Star Weekend ... Bulls’ home sellout streak reached 243 games (includes regular season and playoffs - 201 and 42, respectively).